Today I'm excited to announce a new online service that I've cofounded and developed: National Probate and Estates Group. 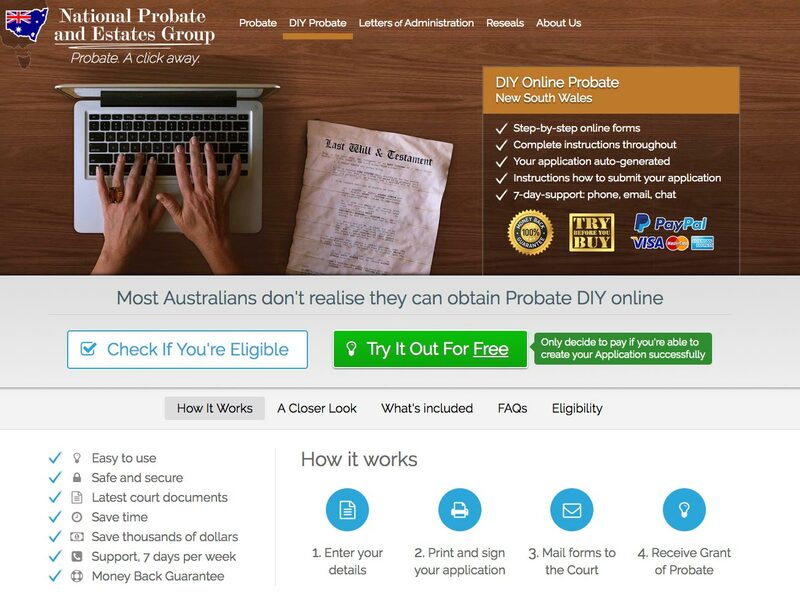 National Probate and Estates Group is an online service assisting estate executors, usually the family members of a recently deceased person, to create and lodge probate applications. The service saves executors thousands of dollars in legal fees by automating the probate process. We've launched initially serving customers in New South Wales, Australia. National Probate and Estates Group also provides Reseals of Probate for New South Wales as well as reseals of Letters of Administration. This allows estate executors and administrators to have a grant resealed from any other state in Australia, or overseas countries in Her Majesty's Dominion including Canada, New Zealand and United Kingdom. Read more about NSW Reseals.